Bottoms Up Harness: Silver Tails Senior Pet Products..
October 3, 2011, the Quaker Pet Group launched their Silver Tails Senior Pet Products line. If you know anyone with a pet, you understand that pets are part of the family. However, I was surprised to learn that approximately 50% of the US pet population (over 80 million dogs and cats) are over 7 years old. With increased access to superior health care, pets are living much longer and deserve special products created for their special needs. It’s estimated that by 2015, more than half of all pets in the United States will require products designed for the unique issues facing senior pets. After extensive research and understanding the challenges pet parents face with their aging pets, Quaker Pet Group created an extensive health and wellness line just for seniors: Silver Tails Senior Pet Products. I was contacted before the launch of this new line of senior pet products to see if I’d be willing to try the new Silver Tails Bottoms Up harness with Tucker. At 14 years old, Tucker already had two ACL surgeries under his belt and suffered from arthritis, so I readily agreed to give the product a try. Unfortunately, before the Bottoms Up harness arrived, Tucker had passed away. If this blog had audio you would hear Lucy beginning to cry. No amount of coaxing would get her to her feet. She quaked and trembled with high anxiety. Our other senior dog, Lucy, has had no joint surgery, but does suffer from arthritic hips. I decided that 13 year old Lucy could give it a go. Not such a great idea. Lucy tolerates the Bottoms Up Harness initially when slipped on her. However, she quakes with nerves whenever we try to adjust it. She’s worried about her hips and I don’t blame her. She was diagnosed with arthritis in her hip joints several years ago and living with younger, rowdy dogs, she’s learned to be careful. She wants no part of the Bottoms Up Harness. We never managed to adjust the Bottoms Up Harness correctly and gave up trying. 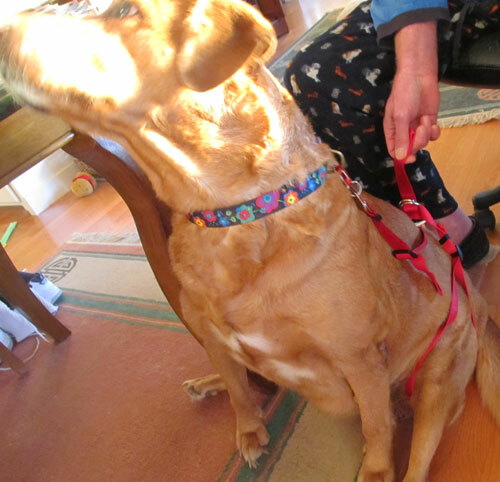 The Bottoms Up Harness is designed to relieve the weight from the hind legs and hips while aiding maneuverability and steadying older, overweight, post-surgical and/or arthritic dogs. The attachable leash for comfort and stability when walking and patented design allows elimination without removing the harness. 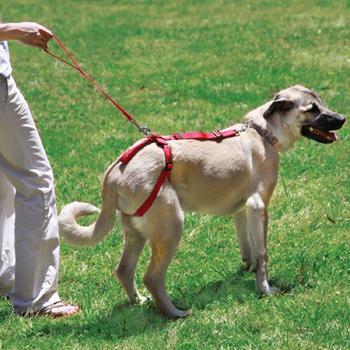 This adjustable harness fits around back legs and attaches across the back to your dog's collar for a secure fit. You can use the strap handle to assist your dog in getting up or the included short leash attached to the double D-rings for a walk. Durable, 1" wide nylon web construction with metal D-rings and swivel clasps and heavy duty plastic slide buckles. We agree with the folks at Quaker Pet Group: just because your senior dog may not get around as well as he or she used to, it’s important to promote regular exercise. Lack of movement can make pain and stiffness from arthritis worse.Plus, excess weight can put painful pressure on joints. In our experience, I think the Bottoms Up Harness would have been a wonderful aid to have had when Tucker had his ACL surgeries. 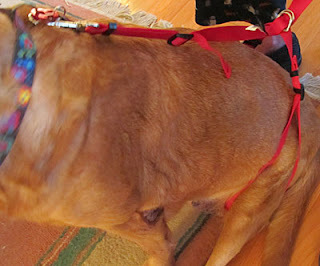 At those times, Tucker was allowed out only on a short leash for walks that were specifically for “doing his business.” The Bottoms Up Harness would have allowed us to easily help steady Tucker on three legs and assist him with stairs and squatting. For Lucy’s painful hips, not so much. Due to the way the Bottoms Up Harness wraps around the upper leg at the hip joint, I suspect that Lucy’s instincts might be correct and that the harness would not be comfortable for her. In addition, I need to note that we live in the country and our dogs enjoy a two acre fenced backyard. We do not walk our dogs on a leash daily. However, for someone whose dogs must go out on a leash, I could see the Bottoms Up Harness being a true lifesaver. If your senior dog has had joint surgery and you walk your dog, we definitely recommend the Silver Tails Bottoms Up Harness from the Quaker Pet Group. This product is available many places and I found it online at PetCo, Amazon and a number of other places. Retail price was $23.99. One size adjusts to fit dogs 20 to 150 pounds. Silver Tails is the first complete line of pet care products solely devoted to the unique needs of Senior pets including products for alleviating pain and discomfort, lack of mobility, decreased appetite, hygiene, dental care, and just plain boredom. Silver Tails products include: hand-held and infrared massagers, a dental care system, magnetic therapy collars, bamboo charcoal pet bed covers and mats, vitamin and mineral supplements, and senior-friendly chew toys. Learn more and follow Silver Tails Senior Pet Products on Facebook.